Montreal was sitting high atop the NHL standings in February of 1959, looking back down at Chicago in second. The Bruins were a point behind the Black Hawks the night Boston stopped in at the Stadium for a visit mid-month — a win would vault them ahead of Chicago. That’s the background here. Many of the 15,046 fans who showed up to watch the game were in favour of the Bruins not achieving this — most, even. Included in that number were members of the Black Hawks’ loyal upperdeck association of fans known as the Standby Club. Whatever they could do to help in the effort to turn back the Bruins, well, they were willing to do that thing. 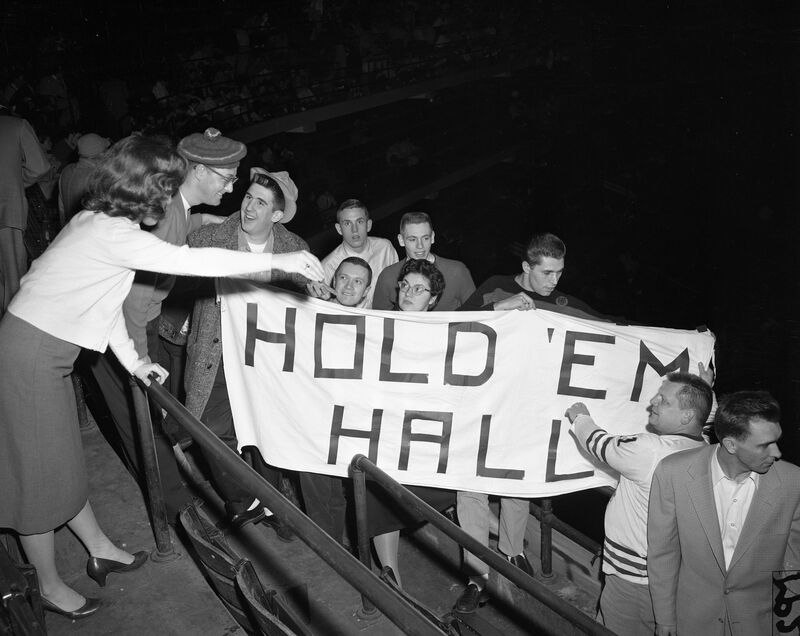 For instance: rigging up a big bedsheet message to exhort Chicago goaltender Glenn Hall not to let in more goals than his teammates could score down at the other end. Marilyn Kluk and Fred Stoneberg were in charge of the operation: that’s them on either end of the banner. And the game? Chicago started off fine, building a 3-0 first-period lead on goals that Ted Lindsay, Bobby Hull, and Dollard St. Laurent put past Boston’s Don Simmons. The Hawk defense was its obstinate best in protecting Hall thru every minute of the second period except the 20th. Guy Gendron lofted the puck toward the Chicago net, and Hall raised his club for the save. The puck barely skinned over the goalie’s blade after running up his arm, then dribbled down his back and into the cage. The Bruins needed just 17 seconds of the 20 minutes allotted for the third period to tie it up. Bronco Horvath scored first at 8:53 followed rapidly by Johnny Bucyk. Bartlett called the Black Hawks “smug” and “profligate” in his write-up, but when the game ended in a 3-3 tie, they were still in second place. Hall held on.